due to another colloquium at the same period, the 4th IGCP638 meeting is postponed to Oct. 28-Nov. 2, 2019 !! The first symposium of the IGCP638 on the geodynamics and mineralizations of the West African Craton (WAC), took place on December 5-10th, 2016 in Dakar. The second symposium of the IGCP638 took place on November 7-12th, 2017 in Casablanca. The third symposium of the IGCP638 took place on October 15-20th, 2018 in Abidjan. The fourth symposium of the IGCP638 will take place on October 21-26th, 2019 in Algiers. This fourth edition will be jointly organized with the WAXI annual meeting. It will join together the international scientific community (professionals of the academic and mining sectors) on the topic: “Geology of the Paleoproterozoic formations for a sustainable development”. The event will proceed in the form of conferences (two days) and of field trips (four days) according to the schedule indicated within the conference and the field trip programme. The sets of themes of the conference will relate to geodynamics, mineralizations, geochemistry, geochronology, geophysics, mapping, lithology, sedimentology, imagery, environment (pollution and deforestation related to mines) and other related subjects. The events and targets lead to: (i) generate active exchanges between the actors of the field (enquiring, expert mining); (ii) produce scientific knowledge on the geology of the WAC for an update of the academic and school programmes and facilitate mining exploration; (iii) reinforce the capacity of the participants on the field methods of the Paleoproterozoic (Birimian) basement geology by the means of field trips (possible sampling of specimens). 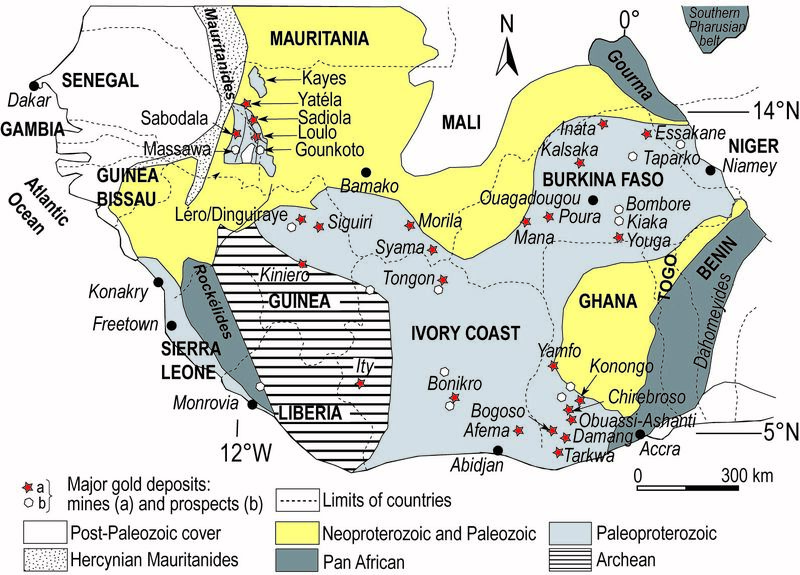 Academic research: improve the knowledge about the relationship of gold-related structures and the geodynamic evolution of Paleoproterozoic rocks (2300-2000 million years) in West Africa. Industrial applications: improved knowledge will be useful for exploration companies for better targetting. Educational training: better knowledge about the geology will be shared in high school education, for better understanding the questions of sustainable development, and resourcing future generations. This IGCP project is focused on the knowledge of bearing mineralizations (particulary gold-bearing mineralizations, Fig. 1) related to the geodynamic evolution of the old terrains (dated between 2300 and 2000 million years), known as Birimian formations (Paleoproterozoic) in the West African Craton (WAC*). The characterization of the Birimian terrains will be investigated through structural, metamorphic, geochemical, geochronological and geophysical data at various scales. The goal is to understand the relations existing between the history of the orogen and the development of the particularly rich and dense metal concentrations of economic interest within the Birimian domain. This natural resource that we will contribute to emphasize through this project, will widely take part in the economic and social development of the West African states. In addition, the knowledge of the Birimian geodynamics could take parting the complement of the “curricula” of the secondary education of West African countries. Indeed, these programmes are currently deprived of chapters on the geology of Precambrian of mining resource of West Africa (geodynamics). They will be developed for a precise knowledge in this field. The results of this project will also allow the public authorities to have scientific guides for the improvement of the mining tools and the education policies in the areas concerned. Fig. 1: Schematic map of the major Precambrian shields of the southern part of the WAC (Man shield), showing the location of the major gold deposits and mines (simplified from Mineral Deposits Limited, 2011). *Algeria, Benin, Burkina Faso, Cameroon, Gambia, Ghana, Guinea, Guinea Bissau, Ivory Coast, Liberia, Mali, Mauritania, Morocco, Niger, Senegal, Sierra Leone, Togo.